Lisa attended a Super Foods class tonight, and I was inspired to create a quick side-dish featuring one… beets! The dish, from Mark Bittman’s How to Cook Everything Vegetarian, sounded super easy to make, and it was — roasted beets are sliced along with avocado, and spooned over the top is a lemon vinaigrette with tarragon and red onion. Perfect — and should only take about 15-20 minutes, right? Right! Unfortunately, I totally zoned the fact that, um, yeah: I’d have to roast the beets first. Gah! That’s like an hour just for that step! So there went my relaxing, look-how-quick-this-was side dish. Oh well, the good news was that Lisa wasn’t going to arrive until late anyway, so I was able to finish up dinner just a few minutes after she walked in the door. Note to self: Think through recipes before deciding when to start! That class made me so hungry — a few hours talking about nothing but food! Hey, did you know beets were a super food? I heart this dish… and… for once, I don’t think these beets taste like dirt! Hooray for CSA beets. This is a great combo… the avocado is perfect. Just a little firmer than one I’d pick if I was making guacamole. Set the oven to 400 degrees and wrap each beet in aluminum foil. Place the beets on a cooking sheet and into the oven for 45 minutes to an hour, until a knife pressed into a beet gives little resistance. (The beets may cook at different rates). Remove and set aside. To make the vinaigrette, place the olive oil, lemon juice, and a tablespoon of warm water into a blender and pulse until emulsified. Pour into a bowl with the minced onions and tarragon. When the beets are cool, peel and slice them. Pit, peel, and slice the avocado. Arrange the beet and avocado slices in alternating layers in a dish. Whisk again the vinaigrette and spoon over the beets and avocados. Season with salt and pepper, and serve. This entry was posted on Monday, August 25th, 2008 at 11:01 pm	and is filed under Salads and Light Soups, Sides. You can follow any responses to this entry through the RSS 2.0 feed. You can leave a response, or trackback from your own site. 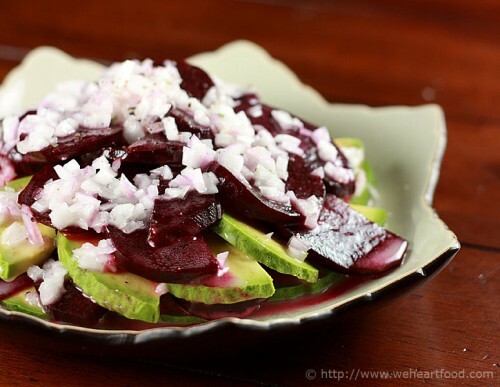 Yummmmm…beets and avocado! Two of my favorites in one dish! I need to make this. Except that Chris hates beets. Well then, more for me! MMMM…two of my favorite foods combined in one salad – and very pretty.